The lucid plucking beats and howling bass shakes your soul with the wonderment of how could something be so sweet yet so dark at once. From Argentina, producer Evar releases his new EP titled I Love You via internet label SIDECHAINS. Composed of 3 decedent tracks, each holds one piece of the puzzle. "Wish We Were Close" embraces wobbly 808s while "Secrets Revealed" leaves traces of heavy bass and rhythmic drum patterns. EP title track "I Love You" concludes your journey with a final statement of blended emotions through the fickle musical strings. With a project like this, it's no question that we had to proceed with a Q&A with Evar on his newest project! Check it out below and make sure to share and give a listen to I Love You! What was the inspiration behind your new EP? This EP is like a collage of things that I like and inspired me to make music in the first place. I was trying to create something that I didn't hear before but something that I would like to listen to. I don't know if people will like this EP at all because I did what I felt like doing at the moment, not what people is ready and expecting to hear, but that's exactly the point of making music to me and the inspiration I had for this first EP. If people say, "Wow this song is weird, but it's catchy though" I’ll be exactly where I want to be with this EP. The "I Love You” name is just because I’m corny; I like to imagine emotional drama love stories behind my songs. Can you tell us a bit about the creative process for I Love You? For ILY I used very few VSTs. I started writing the melodies on my piano and recording them. The drums are also recorded with a launchpad; there’s nothing programmed inside Ableton. I had the opportunity of recording some very good synths back then when I was in music school, and most of the synths in the EP are real synthesizers. There’s a reverse vocal that appears on every track that I also recorded myself. I wanted to make things very dynamic, and I think the more you record yourself playing chords and drums instead of programming note by note on your DAW, the more your song will have that special feel and rhythm. So yeah it was all of the fun. Do you have a favorite track on the EP? Definitely "Secret Revealed.” I think this is the one with the best arrangement and has a special place for me because I made the melody like two years ago and I always liked it but didn’t know what to do with it at that time and it ended up becoming part of the EP two years later. I get very nostalgic when I hear it to be honest hahaha. Also, this is the one that represents my style more accurate I guess. 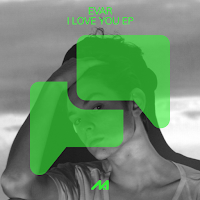 With I Love You being your first EP, what do you hope this project will deliver for you as an artist? If I can move at least one person with this, that’s enough, that would mean everything to me. I’m already working on tons of new music, and I think this EP was the door for me to understand that there aren't rules in music, nobody is telling you what to do, so this EP already did the trick for me while I was making it. Right now I just hope people enjoy it. There's a lot more to come.